This is era of social media and social networks, many platforms have gained popularity in social networking competition. WhatsApp is also one of them and can be clearly listed in one of the most used app on smartphones. There are number of reasons to use WhatsApp and many people must have it on their phones, you can follow this guide if you want to download WhatsApp for iPhone. WhatsApp allows you to make calls, text, send pictures, videos, files, share stories in a convenient and fun way. You can also make groups and stay connected with your friends and family all of the time, it also features end to end encryption for security and relatively lower data consumption for communications and there are many more features and reasons to use WhatsApp. Step 1: Go on your Homescreen ant tap on App Store app. Step 2: Now tap the "Search" button with a magnifying glass icon on bottom right. 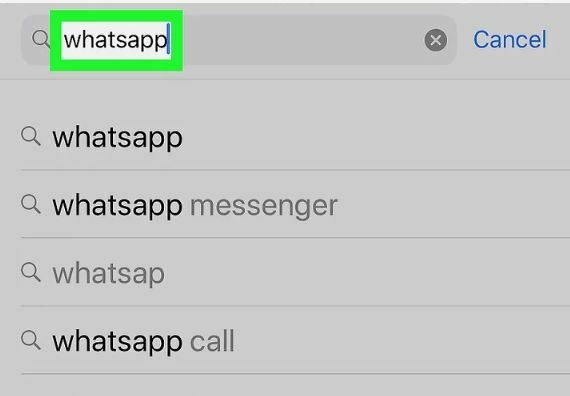 Step 3: Now type "WhatsApp" and search it. Step 4:You will see the WhatsApp app icon on top, tap it. Step 5:There will be a "Get" button, tap it and downloading will start. Step 6: Once the downloading is done, App icon will show up on your Homescreen. Note: Make sure you are logged in App Store with your Apple ID in order to download any app from App Store. Step 2: Now click "Account" menu from top and then select "Sign In". Step 3: Now login with your Apple ID, this ID must be same logged in your iPhone. Step 4: Now once again click "Account" menu and go to "Authorization" and select "Authorize this Computer", this is very important for syncing apps from iTunes to you iPhone. Step 5: Now search for "WhatsApp" in iTunes and then click "Get" button to download the app. Step 6: Now click "View" menu and then click "Show Sidebar", some items will be displayed on left side of the iTunes. Step 7: Connect your iPhone with PC via USB cable and you will see your iPhone appear in side panel of iTunes. Step 8: Now click device button and then go to "Summary>Apps" on device window, select apps you want to sync including WhatsApp and click "Sync" button on bottom right. We have clearly answered the question, "How do I download WhatsApp on my iPhone". you can use the above mentioned methods to do so. In addition to that we are also gonna tell how you can backup your WhatsApp conversations on PC easily using an awesome tool called Tenorshare iCareFone. Step 1: Download iCareFone on your PC, launch it and connect your iPhone to PC via USB Cable. Step 2: Click "Backup and Restore" from main interface. Step 3: You will see several things on interface, select "WhatsApp & Attachments" and then click "Backup" to start the process. Step 4: Once the process is done click "Export to PC" and save the data on your computer. We have covered 2 methods on Whatsapp 2 for iPhone download, before trying any of the method make sure you have a working Apple ID and you're connected to reliable internet connection. One method involves using App store to install WhatsApp on your iPhone/iPad and other requires iTunes and a working PC. We also have recommended our personal favorite tool for keeping iOS device healthy, this tool can do lots of things and among them one is transferring and backing up messages easily on your computer.